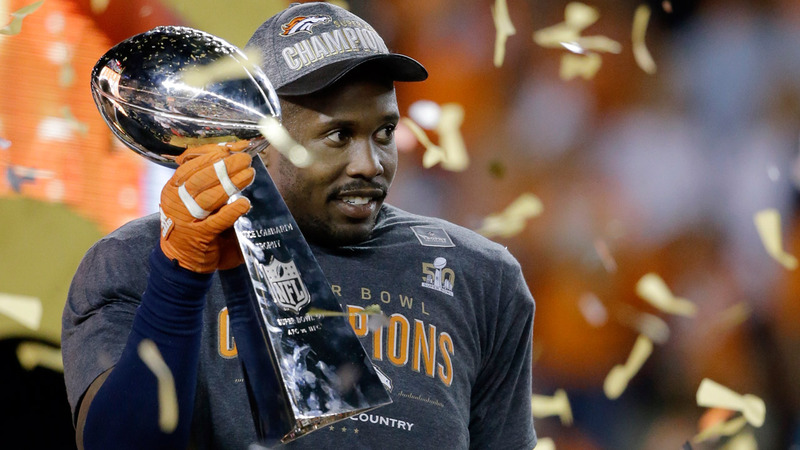 Von Miller was second-to-none in the Super Bowl. Five years after being drafted No. 2 behind Cam Newton, Denver linebacker Miller harassed Carolina's quarterback from start to finish Sunday, forcing two fumbles, compiling 2 sacks and earning MVP honors while helping the Broncos beat the Panthers 24-10 in a showdown between a couple of shutdown defenses. Miller really was everywhere - and he did a bit of everything. He created Denver's first touchdown by zooming past right tackle Mike Remmers and breaking in on Newton to rip the football away from the QB, who was honored as the regular-season MVP on Saturday night. The fumble bounced into the end zone, where defensive end Malik Jackson landed on it to put the Broncos ahead 10-0 about 8 1/2 minutes into the game. With 4 minutes remaining in the fourth quarter, Miller set up Denver's only other TD, too. Again, he got past Remmers and, as the offensive lineman grabbed a fistful of his white jersey, Miller reached out with his left hand to grab Newton's right arm as the quarterback brought the ball back to throw. This one was recovered by safety T.J. Ward at the Carolina 4, and soon thereafter, C.J. Anderson's 2-yard run sealed the victory for Denver (15-4). Earlier, Miller laid a big hit on Newton near the sideline. He also shared a third-down sack with Derek Wolfe to get Denver the ball back at the end of the third quarter. And, showing his versatility, the 6-foot-3, 250-pound Miller even made plays in pass coverage, dropping back to force an incompletion from Newton to Jerricho Cotchery at one point. It was all part of quite a display by Miller and the rest of Denver's defense, making the NFC champion Panthers (17-2) and their No. 1-ranked offense look mediocre at best. The Broncos wound up with a Super Bowl record-tying seven sacks, showing off the rush that led the NFL with 52 sacks this season and knocked around New England Patriots quarterback Tom Brady so frequently two weeks ago in the AFC championship game. Miller had 2 sacks in that one, too. Two years ago, when Peyton Manning directed the NFL's best offense, Denver got walloped 43-8 in the Super Bowl by the Seattle Seahawks, owners of the league's best defense. General manager John Elway set out to build the Broncos' D, adding players such as DeMarcus Ware, T.J. Ward and Aqib Talib. But Miller, who missed that loss to Seattle because of a knee injury, already was in place, set to pair with Ware as a dangerous duo. Now comes the offseason and contract negotiations for Miller, someone the Broncos would probably love to lock up for the long term.